Trade shows in the alcohol industry can be tricky when you need to stay sober and network, but a festival coming to London will make drinking on the job a lot easier. Beer has been one of the biggest success stories of the low-and-no category. 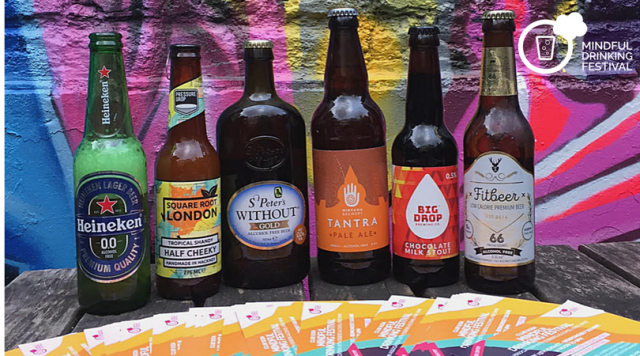 The Mindfulness Drinking festival, which is returning on 28 July after its launch last August, celebrates innovation in low and no-ABV drinks; a small but fast-growing niche in the market. the festival will take place at Spitalfields Market between 11am and 6pm, and is free to attend. Around 10,000 people are expected to attend the event, which is being run in association with Club Soda and Heineken’s 0.0 beer label, featuring over 50 brands from the low and no-alcohol category. Premium mixer pioneer Fever-Tree has been drafted in to man a tasting during the day for an audience of “mindful drinkers,” who will also be able to try one of the dozens of non-alcoholic and de-alcoholised wines, beers and even spirits which have launched in the UK over the past two years. This year’s festival will showcase 10 alcohol-free distilled botanical spirits, many of which will launch in the UK market on the day. Exhibitors will include independent producers like Ceder’s — a distilled non-alcoholic alt-gin made with classic gin and exotic South African botanicals — as well as bigger brands such as Diageo-owned Gordon’s, which released its own “ultra-low” ready-to-drink products earlier this month. Beer writer and sommelier Jane Peyton will also speak at this year’s event – giving people a personal tour of the ten alcohol-free beers featured at the event from breweries including Nirvana, FitBeer, Big Drop, and St Peter’s Brewery. Bar group Be at One, which hospitality group Stonegate recently bought for a reported £50 million, will also make an appearance with bartenders offering non-alcoholic cocktail masterclasses. The event will also feature a “Quit Lit Festival,” with talks and seminars from authors who have written about their journey to cut back on their drinking or have given up altogether. A 2017 survey by Drinkaware found that nearly one fifth of UK drinkers say they are cutting down their drinking habits. As a result, many drinks firms have invested in de-alcohlised spirits; a small but growing niche in the market. Following the success full launch of Seedlip’s first botanical drink in 2015, Distill Ventures, a Diageo-funded spirits innovation group, bought a minority stake in the business in 2016. And earlier this month Pernod Ricard signed a deal to launch and distribute South African/Swedish brand Ceder’s in the UK, which describes itself as a “non-alcoholic alt-gin made with classic gin and South African botanicals”.